This activity is intended for primary school students and middle school students, but also it could be adjusted for young children. The paint used in this project is permanent, it doesn’t come off garments, therefore, aprons or painting shirts are essential. 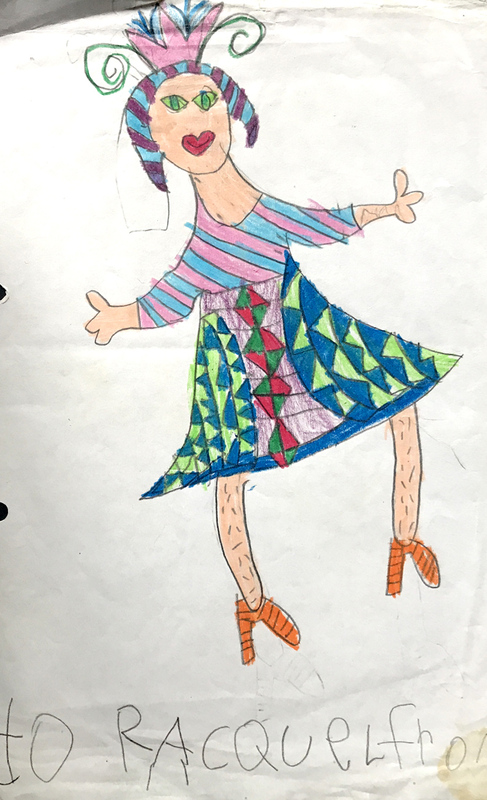 Students should prepare a small number of preliminary sketches, two or three, and choose one for their final design. 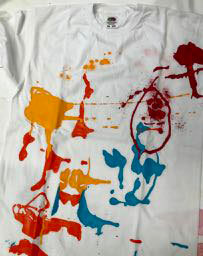 After deciding which design will be used, students will draw the chosen design on the T-Shirt using a 6B pencil. 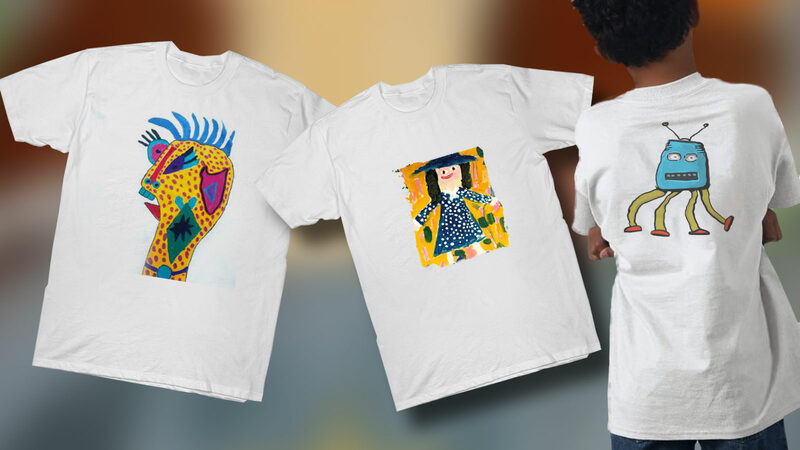 Before drawing the design on the fabric, it is important to insert a piece of card or thick paper in the shirt to facilitate the drawing and later on, when painting, to stop the paint going to the back of the T-Shirt. Ideally, T-Shirts should be white and made of 100% cotton. We find that the best paint for fabric painting for school students would be a Flow Acrylic Paint like Chromacryl Fluid Concentrated acrylic paint for example. 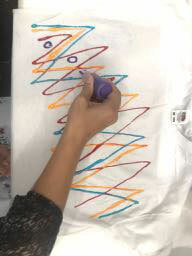 Any acrylic paint can be made into a fabric paint by adding Textile Medium, so if flow paint is not available, classroom acrylic paint would be fine. For this project we have used Chromacryl Textile Medium which is a school quality medium. We found that by adding the medium to the flow paint, it makes painting easier specially when painting small details and lines. Flow paint comes in small and medium size bottles, a set of three primary colours plus black and white of 250 ml/8.45 oz. bottles should be enough for a class of 30 students. 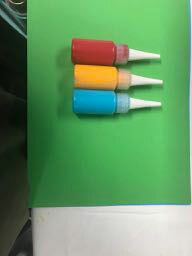 The best way to dispense flow paint is to use small plastic containers with lids. 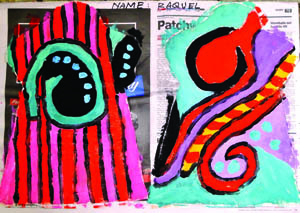 Mix ratio: 2 parts of paint and 1part Textile Medium. Place paint in containers, add the Medium and mix well. To paint very fine lines, use soft squeezable small plastic bottles. 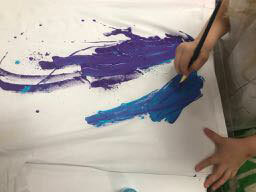 To set the paint, place a piece of cotton or paper on top of the design and press with a hot iron. 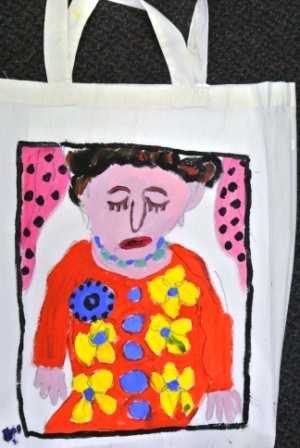 Note: this method will work with other textile painting projects, like painting on Calico bags or puppets costumes, for example. 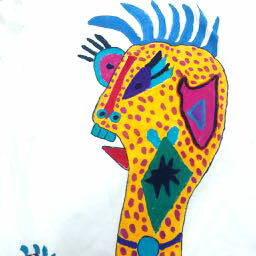 What is important is to use the right mix of acrylic paint and Textile Medium.